I went camping with a friend in New Mexico last week with a glimmer of a hope of seeing the elusive and critically endangered Mexican gray wolf. No dice on the wolf (though we did hear a likely howl and see possible tracks.) But while we were lying in the tent late and night and early in the morning, we did hear a peculiar bird kind of monotonous beeping. The creature, my friend said, is known as “the back-up bird” because it hoots like a garbage truck backing up. Here’s a recording from owling.com. I can’t find a reference to that nickname online and we never got to see the owl, either. 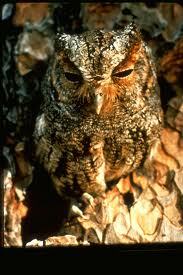 But it’s stuffy formal name is the flammulated owl (Otus flammeolus). Not quite sure what flammulated means. Some use flamullate as an off-white color. Google translates the Latin as “dainty bridal veil.” Owlpages says it means flame-shaped or -colored. There’s also a flamullated flycatcher, which is the most boring gray you’ve ever seen. This little bird, common out west, certainly deserves a decent nickname.